Navarra export catalogue - Tiruña, S.L. 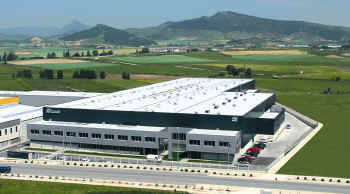 Since the companys inception in 1921, TIRUÑA S.L has maintained afirm commitment to two goals. First, to meet and exceed current customer expectations and secondly, to make the necessary financial and intellectual investment to insure the customers future requerements will be meet and exceeded. Beginning 2003, we have just moved into a new state-of-the-art manufacturing facility. This new facility, 17.000 square meters under one roof, will allow TIRUÑA S.L to continue and expand their commitment to provide the very best Corrugating Roll values and solutions to customers around the word. Tiruña S.L manufacture and manufacture and mechanize, since more than 60 years, being one of the most important specialized workshop of Europe. Moreover, we offer services to customers in 40 countries worldwide through a well-established network of local partner agencies. These productos mean 70% of Tiruñas turnover. We have also recently established a new Corrugating Roll company, Tiruña America Inc, which will be located in USA, together with the company Fosber America Inc. The Tiruña rolls are specially designed to suit customers needs and we offer more than 300 different profiles so as to meet their requirements. Tiruña has developed an innovative new corrugating roll flute design which is known as Pyramid Profile which the strength of board is increased. Amond the innovations carried out by our technical departmente, we can find the Dry Dynamic SystemDDS) Corrugating rolls eliminates the Banana Effect experienced the rolls. The Internal Dynamic Damping, or IDD Pressure Roll has been developed to eliminate the vibrations. 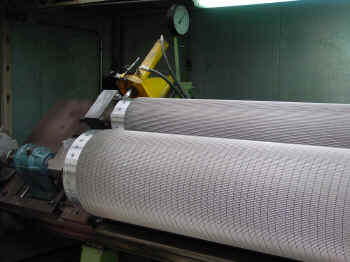 A new innovation is the Advanced Peripheral Heating Corrugating Roll. This new design greatly improves the transfer of heat to the perimeter of the roll.